It’s a good thing to have dreams of a sustainable landscape design. As a Landscape Designer, one of my dreams is to create the perfectly sustainable outdoor spaces for a client, or maybe for myself one day. The overall theme of any sustainable garden is to minimize the use of water, use renewable resources, and even use some repurposed or recycled materials in the design. In this scenario, I am imagining a fairly typical San Diego city lot, not oversized, but plenty of space to accomplish all of the following elements. A front yard that attracts wildlife, mainly birds and hummingbirds. One that can claim to be a actual “Wildlife Habitat.” All new hardscape such as a driveway or front walk would be constructed from permeable pavers. These are manufactured with built-in spacers to allow for water to seep between instead of running off to the curb. I’d add a bio-swale to collect any water from downspouts. This is a subtle depression that I’d line with cobble stones that would allow storm water to stay on the site and replenish the ground water. I’d add deciduous trees to offer cooling in the heat of summer and allow sunlight to filter through to add warmth in the winter season. And using some type of trees that have seeds to feed birds and other wildlife would be a welcome design criteria as well. 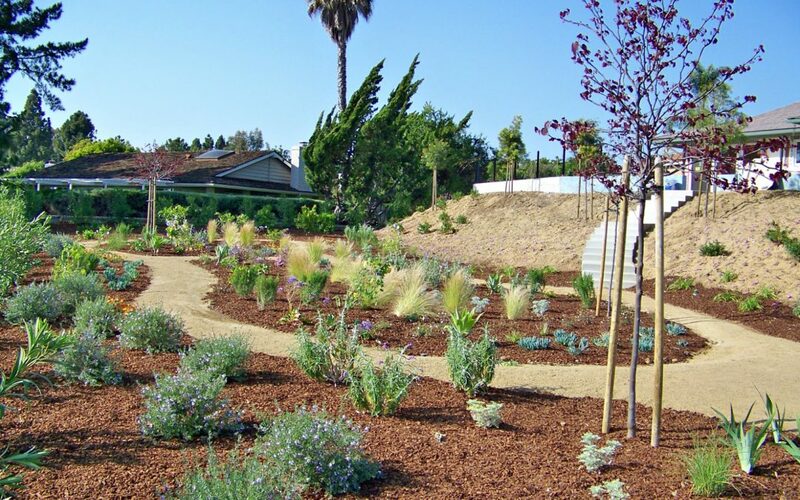 Overall plantings would be strictly California Native plants, such as ground-covering Ceanothus or California Lilac, various Salvias or Sages for fragrance and color, native grasses for texture and movement with the breeze. For a focal point, I’d use large, rugged boulders and smaller, rounded cobbles and perhaps some areas of decomposed granite or “DG” as it is typically referred to. This time, I’d stay away from the typical dry creek bed as they are becoming far too common in our new front yards without turf. New paths would be shredded hardwood mulch without edging for a more natural look and feel. And irrigation would be all drip and of course it’s use would be nearly non-existent after two years when the native plants are well rooted. In the backyard, I would create new patios of natural flagstone. Some of the new patios would have groundcovers growing in the joint lines. This would employ the use of Netafim irrigation which is all underground. I could imagine in the design, placing a pergola for some shade. Given the structure itself, adding vines, such a grapes or kiwi would add an edible factor and additional cooling. I may consider adding other features such as a fire pit and design it to feel more natural, using boulders instead of stucco. An area for a built-in bar-be-que might be an option. And in some fashion, I’d place rain barrels to collect any precious rainfall to be later used for the garden. Another element of sustainable landscape design is the use of edibles for the backyard, I’d have to have at least one raised bed for vegetables. Have you ever harvested your own spinach and consumed it the same day? It tastes so much better than store bought. I would add a wood trellis to accommodate another vine plant such as Passion Fruit. And then an area for dwarf fruit and citrus trees would be a key factor in the design. Lemons, Limes, Mandarins, Kumquats, Peach, Plum, and Nectarine, so many great choices for healthy eating. Additional plantings would include Pineapple Guava, Pomegranate, Fig, Artichoke, Blueberries, etc. Some of these plants can be used as hedges or screens to add privacy as well as produce a harvest. The remaining spaces would incorporate ornamental grasses and succulents, easy on the water and easy to maintain. Finally, no garden is complete without a place to compost. 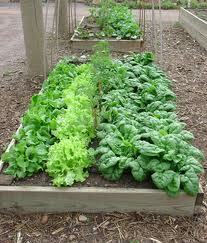 Turn all the clippings and kitchen scraps into beneficial nutrients to add back to the garden beds. Is this really such a fantasy? With thoughtful planning, some interest in gardening, and patience this could be your outdoor sustainable landscape. You may not achieve all of these elements, but doing even a landscape with a portion of these ideas can help you save money and water and have a more healthy diet as well as lifestyle. We know our planet is in peril. Nearly every season some major weather anomaly occurs affecting millions of people in some adverse way. It’s time that every individual who has real property does his or her part to influence a positive shift in our climate change. Living sustainably is just one way we can all guarantee a future for our next generations. To follow the trend and have your own sustainable landscape design, contact Letz Design to get started.